Avery's sweet little fingers, I love the wrinkles. It has been ridiculously hot around here. Yesterday afternoon, after a whole lot of fussing, I convinced the girls to go outside and play in the sprinklers. Actually, Nathan promised to join them which may have been the only reason they finally went out and did it. After getting all wet, Emma found the mud and Sadie soon joined her. This was the result after an hour out on their own. Yesterday we made our way home from the hospital with our newest little one, Avery Kate. She was born August 25th, at 12:17pm and weighed 8lbs, 1 oz. She is doing well and the girls can't get enough of her. If it was up to Sadie, she would be holding her all day long. Emma says that she likes to take care of her, while Sadie just likes to play with her. So I said Emma was the little mama and she laughed. All these pictures are much of the same, from yesterday afternoon, the hottest day of the year so far. A nap in some dappled afternoon sunlight seemed appropriate. They are all so sweet that I posted them all, regardless of repetition. I, for one, can't get enough of her. Sadie:" The best things in the world are free, did you know that? "Emma: " Really?" Sadie:" Yes, like love....animals..." Emma:" Hands?" Sadie:" Yeah, and...help..."
One week countdown until we meet our newest little one. And it all is coming at me at once, a bit nerve racking and scary, as it has been with each addition to our family. I guess my way of dealing with overwhelming stress is to put off the freak out until there really is no time to freak out, you just have to deal with it in the moment. So this week has been filled with a bit of that. Everyone is excited as am I, but it will be a whole new world with three, a newborn, a preschooler, and a second grader. Why every family should eat at least one meal together, preferably dinner. Emma opens with a dinner blessing. Emma:" Thanks for all of this day, thanks that Mama could make the dinner, and thanks that the baby is coming along nicely. In Jesus name we pray, Amen." Me:"Did you know that a lot of apple juice comes from China?" Nathan: " Oh wow, no I did not." Then some more conversing about apples, etc. Me:" Actually apples come from China. The first apples were native there and then people took them and changed them until we have the apples that we eat today. Wild apples are sour, not sweet." Nathan: "Like horses, they came here from Spain. They did not used to have horses here." Me: "Actually I think horses are from China originally too." Sadie:" Yeah, and lots of little workshops." We packed up a picnic and headed due south, out onto the point, for a bit of adventure today. We stopped at a bench over looking the Pacific, had a bit of lunch then headed over to see the lighthouse and down the Bayside Trail(above). On our way out to the lighthouse, Emma spied a statue claiming that it was the Liberty statue. Well, said I, actually that is a statue of Cabrillo. Sadie thought I was mistaken and that the statue was actually of Columbus. I tried to explain why it was Cabrillo rather than Columbus with some very rusty strands of history that I could quickly access floating around in my head, and said I think it all ended with Sadie saying, "I know." Every seven year old is a know-it-all. It is late summer here, which means it has not rained any of the ten inches the point receives each year, since probably March. Everything is quite dry but amazing enough, some scrub was flowering thanks to the damp sea breezes. Ok, so Mama and Daddy bought her ONE present to open. Industrious Pregnant Lady builds a fort for three. Here is Honey sleeping in the fort. She stayed in there all day, sleeping. Sadie and Emma read books in the fort after dinner. Emma decides she needs a nap with baby and the ipod, in the fort. 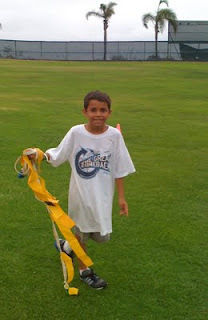 This week was VBS Sports camp at PLNU. Sadie chose track as her sport. Throwing the shot. Throwing the hammer, kid's version.